Human rights activists hold pictures of Saudi journalist Jamal Khashoggi during a protest outside the Saudi Consulate in Istanbul, Turkey, Oct. 9, 2018. American President Donald Trump said on Monday that he had spoken with Saudi Arabia’s King Salman. The president said the king “denies any knowledge” of what happened to the Saudi reporter who disappeared in Istanbul two weeks ago. Jamal Khashoggi is a Saudi citizen who was living in the United States at the time of his disappearance. 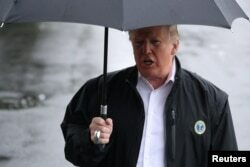 U.S. President Donald Trump talks to reporters from the White House in Washington, October 15, 2018 before leaving for Florida to inspect hurricane damage there. Trump said the Saudi leader “didn’t really know” what happened to him. “Maybe, I don’t want to get into his mind, but it sounded to me like maybe these could have been rogue killers – I mean, who knows?” he added. Trump is sending American Secretary of State Mike Pompeo to the Middle East to investigate the situation. The president said Pompeo will meet with King Salman. Khashoggi wrote for the Washington Post newspaper. Some of his opinion pieces are critical King Salman’s son, Crown Prince Mohammed bin Salman, who is called MBS. Many observers say he is a more powerful force in Saudi Arabia than the King. Turkish officials have said they believe Saudi agents killed Khashoggi after he entered Saudi Arabia’s consulate in Istanbul. They also said Turkey has audio and video recordings of the attack. The Saudi government says the Turkish claims are “baseless.” It says Khashoggi left the consulate the same day he came. However, it has not provided evidence to support that claim. Saudi Arabia has threatened economic action for any U.S. action designed to punish the country. Consulates, embassies and other diplomatic offices worldwide are often considered safe places. Yet they have not always been impervious to acts of violence. Killings, suicide bombings, militia attacks and hostage crises all have taken place in diplomatic buildings. Supporters of the Ansar al-Shariah militant group attacked two U.S. government offices in Benghazi, Libya on September 11, 2012. U.S. Ambassador Chris Stevens and three other Americans died in the attack. Last year, a U.S. jury found Ahmed Abu Khattala, a Libyan man, guilty on several terrorism-related charges for his part in the attacks. On October 7, 1999, a group known as the Vigorous Burmese Student Warriors attacked Myanmar’s embassy in Bangkok. The attackers took 38 hostages to demand democracy in their country, also known as Burma. Thai officials gave the hostage-takers permission to fly to the border. The move angered the government in Myanmar but ended the incident without violence. Two hundred twenty-four people were killed when trucks carrying bombs exploded near U.S. embassies in Kenya and Tanzania on August 7, 1998. Al-Qaida claimed responsibility for the attacks. Most of the victims were Kenyans, but 12 Americans also died. The man suspected of plotting the attacks, Fazul Abdullah Mohammed, avoided capture for 13 years before he was killed at a security stop in Somalia’s capital, Mogadishu. On December 17, 1996, Tupac Amaru rebels seized the Japanese ambassador’s home in Lima, Peru. At that time, the ambassador was holding a large party to celebrate Emperor Akihito’s birthday. Diplomats and government officials were taken hostage. The group demanded the release of jailed rebels. The group held 72 people hostage for 126 days before Peruvian government troops attacked. One hostage, two soldiers and all rebels were killed. A suicide attacker drove a truck filled with explosives into the Egyptian embassy in Islamabad on Nov. 19, 1995. Fifteen people died in the attack. Egypt found Ayman al-Zawahri, an Egyptian citizen and leader of a militant group, guilty and sentenced him to death in absentia. Al-Zawahri later combined his group with al-Qaida and took the place of Osama bin Laden as al-Qaida’s chief. A bomb destroyed the Israeli Embassy in Buenos Aires on March 18, 1992. The attack killed 29 people. Two years later, a Jewish community center in the city was bombed, killing 85 people. It was the deadliest bombing ever in Argentina. Israel and Argentina have accused Iran of being responsible for the bombings. Iran has denied any part in the attacks. I’m Caty Weaver. And I’m Jonathan Evans. The Associated Press reported this story. Susan Shand and George Grow adapted it for VOA Learning English. Caty Weaver was the editor.